The Vitamin C Foundation recommends that every man, woman and child over the age of 3 consume at least 3 g (3000 mg) vitamin C daily in order to enjoy optimum health. We recommend more vitamin C during pregnancy (6000 mg), and much more while under stress or fighting infectious diseases (e.g., 20,000 to 300,000 mg). Vitamin C is defined as the substance the cures the deficiency disease scurvy. This separates ascorbic acid (C6H8O6) from the unscientific "natural vitamin C complex." Such a thing can be defined to exist, however, any such complex minus ascorbic acid does not and cannot cure scurvy, and therefore, cannot be "Vitamin C."
Our recommendation is more than 30 times what the United States Government's National Academy of Sciences recommends (75-90 mg), and 15 times more than what the Linus Pauling Institute and the Levin group at the National Institutes of Health recommend (200 mg). Linus Pauling recommended 2 to 6 times the Foundation's vitamin C RDA (6000 to 18,000 mg vitamin C). Pauling wrote that his recommendation was based on the large amounts of vitamin C animals make for themselves, and on the amount humans must ingest orally to achieve similar levels. Our recommendations are partly based on the work of Dr. Robert Cathcart, III. Cathcart determined that the ability to tolerate oral intakes of the vitamin vary between 4 and 16 g daily during ordinary poor health. 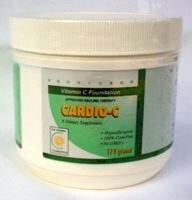 Cathcart's clinical experience demonstrates that virtually every human being will tolerate 4 g vitamin C daily. The Foundation recommends 1 g vitamin C for children based on their age, up to the age of 3. One gram for one-year-olds, two grams for two-year-olds, etc. Our recommended daily allowance may not prevent or resolve diseases related to lack of vitamin C. For example, we believe that heart disease requires from 6000 to 18,000 mg vitamin C, and that cancer may require 14,000 to 30,000 mg daily.